A special thanks to the Lloyd family of Asheville, North Carolina for donating some potentially never-before-seen historical photos of the old L&N Railroad Bridge at Danville, Tennessee. The photos were from a family member who was the engineer for the L&N Railroad bridge during the construction in 1931-1932. The bridge’s history dates back to the Civil War era. It was replaced in the early 1930s (of which these photos are from) and raised in the early 1940s for the creation of Kentucky Lake. Two old spans of the former L&N Railroad Bridge exists today and are privately owned. Make sure and read our profile on Explore Kentucky Lake about the Danville L&N Railroad Bridge and the abandoned transfer elevator, which sits in the middle of Kentucky Lake today. 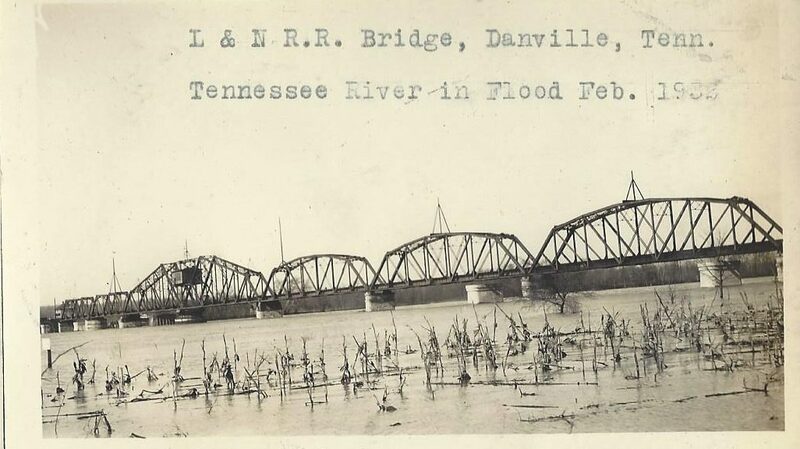 This is the old L&N Bridge at Danville, Tennessee. Photo taken July 21, 1931.